Ninety-six years ago today at 11:00am the guns fell silent. The Great War was over. Unfortunately like every successful movie there was a sequel, and as usual it was much worse than the original. War has been a part of our world since time immemorial, and to this day we dream of a day when that will no longer be the case. I would like to invite you all to join me this morning in standing for two minutes of silence. On Remembrance Day every year those of us who served, and especially those of us who served in combat, ask you to join us to remember our friends, our brothers, who did not make it back. We ask you to join us for two minutes every year to remember those that we remember every day – every minute of every day – of our lives. To many the phrases like ‘All gave some, some gave all’ is a catchy phrase. For those of us who lost friends, whose friends came back missing limbs, who came back with a darkened soul, it is much more than that. We did not do what we did for honour or glory or the medals that would decorate our chests and eventually find a place in a drawer, We did it in the hope that our children would not have to. There will never be another ‘Great World War’ like 1914 and 1939 – the nuclear age and the dissolution of the nuclear superpowers saw to that. The wars of the immediate past and of the future are very different and for some that makes it harder to recognize them as wars, but they are wars and the toll they take on our soldiers, sailors, Marines, airmen is just as harsh; often because of the reception back home it is much harsher and lasts much longer. Today I ask you to stand at 11:00am with me. You don’t have to salute and you don’t have to stand at attention, but stand and do not fidget. Remember the men and women who put their lives in harm’s way so that our world can be free of tyranny and oppression. Remember those who got onto boats, planes, trains, and busses to go meet the enemy so that you, your parents, and your grandparents could be safe. Remember those buried in the fields of Flanders, Ypres, Dieppe, Normandy, and hundreds of other fields beneath crosses and stars and too often unmarked ground… in Europe, the Pacific, in Africa and the Middle East. On the ground and at sea, they served so that we could live free. Perhaps the most famous poem that honours our fallen soldiers is by a Canadian named John McCrae. He served in World War I, was a physician and held the rank of Lieutenant Colonel. He fought in the Second Boer War earlier, and when the Great War broke out in 1914 he joined the Canadian Expeditionary Force. Although he was a doctor he opted to join a combat unit, and while he was also the medical officer he was also a gunner. He believed in duty, and fought for his country and for the British Empire. LtCol McCrae died in January, 1918… he did not see the end of the Great War, nor the publication of his famous verses. We remember him, along with all of the rest. 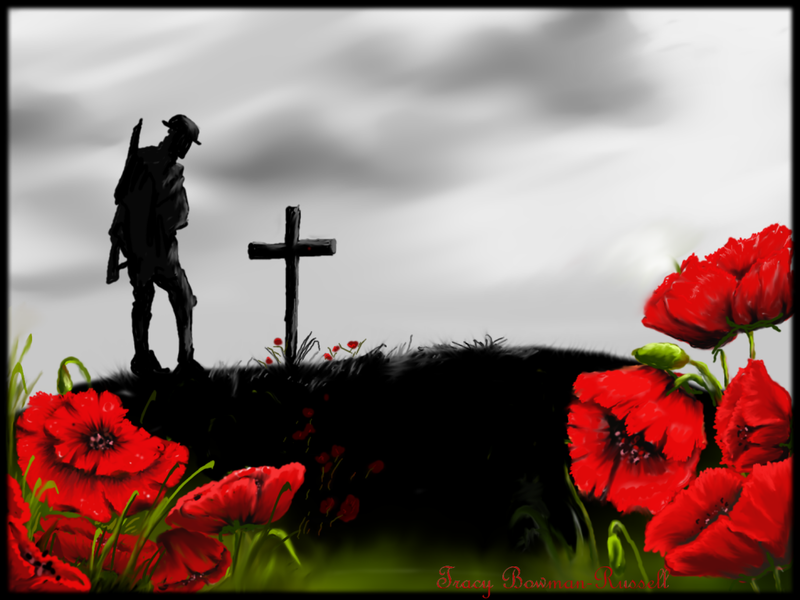 Lest we forget those who fought for us, protected us, died for us. A fine post, Staff Sgt. Thank you. And as every year, I followed the ceremonies at the National War Memorial in Ottawa today and observed the silence. The recent terrorist attacks on our soldiers, one of them murdered on ceremonial guard at that same War Memorial, made it especially poignant this year. As a consequence, close to 100,000 Canadians came out in the cold to witness the proceedings, the largest turnout since the original dedication in May of 1939 by His Majesty King George VI of Canada, just over 3 months before the outbreak of World War II. Notably present were a number of servicemen and women in uniform, even though they have been advised that their uniforms make them terrorist targets. The memorial was rededicated today to honour the Boer War 1899-1902 and the Afghanistan Mission 2002-2014. A message from Her Majesty the Queen of Canada was carried to Ottawa and read by the Princess Royal, Princess Anne. My personal reflection is for my Parents, both of whom served in the clandestine theatre of World War II. I have done a bit of sleuthing and speculating on their roles in the War, while staying clear of the Official Secrets Act which automatically took affect in Canada once passed in the UK, under Canadian law of the time. It appears that my father was seconded from the RAF to Project Dayton, breaking the Enigma code. I know that the British Military Intelligence recruited code breakers with puzzle contests in the newspapers and he has always been an amazing puzzle solver; even in his 70s he would do the weekly Times (of London) cryptic crossword in 15 minutes! Meanwhile my Mother appears to have left Toronto to join the Intrepid network, that totally clandestine Anglo-American-Canadian enterprise, in Washington DC. My mother must have been quite an asset; she could type 90 words per minute even on the manual typewriters of the time, and could add a column of twenty four-digit numbers or multiply two five-digit numbers in her head, in seconds. My parents met and married in Dayton and returned to Canada after the War. They were among the unheralded victims of the war, taking their oath most seriously and never to their dying day revealing any secrets or even their role. They had been provided elaborate cover stories, complete with photographs and fake medals, and I believed it all the time I was growing up. I can tell you that it was entirely debilitating for them to live with that burden, especially for my father. It left him embittered and feeling betrayed by his native King and Country after 6 years of loyal service and, unable to talk to anyone for fear of revealing a confidence, it ate away at him to the point that he resorted to both food and alcohol abuse. Fortunately he was able to recover his health later in life and live to his mid-80s. My son and I were with him at the end, and such was his sense of duty that he took his secrets to the grave. My mother died later of Alzheimer’s disease and never knowingly revealed her role. However, my son was visiting her at a time when her retrograde memory returned her to the time of her 20’s. She told him of the bombing mission plans for Hamburg and other German cities that she had to complete and take to “the General”. “Shh, mustn’t tell!” So we knew for sure that she had also lived a double life, and lived with the burden of keeping secrets even from her family. So on November 11, I think of them and the invisible wounds they bore in silence in service of their King and two Countries. I feel honoured to remember my parents as representing the unknown thousands of silent heroes and hope that they would be pleased that their stories have now been told.